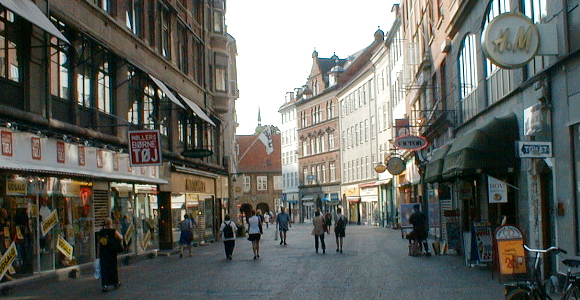 The pedestrian street in Copenhagen is a maze of small and big streets with hundreds of shops and cafés. The pedestrian street "Strøget" is the world largest and oldest - and is just like a maze of several walking streets that runs from east - the Town Hall Square - to west - the Kings Square (Nytorv) and to Nyhavn. The walking street - passes trough the central parts of the city as well as the old medieval city and Latin Quarters - and is connected to many large historical squares. The busy - Frederiksberggade in 1929 - and long before it was turned into the longest pedestrian in the world - established as "Strøget" in 1962. 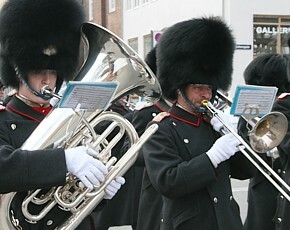 Every noon - the Royal Guard will march through "Strøget" to the royal residence - Amalienborg for the daily changing of the guard ceremony. The pedestrian street was establish in 1962 and has been a great success - especially for tourists and shoppers. 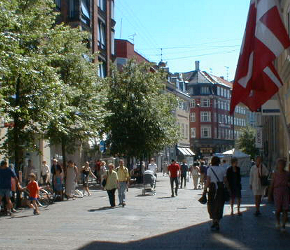 Since then - many streets in the area have been changed into pedestrian streets and linked to the main walking street "Strøget". The pedestrian street system in Copenhagen is slowly expanding and since its development 1962 - many new fashion shops - restaurants - sidewalks cafés - department stores etc. - and there is always some kind of activity day or night in this part of central Copenhagen. 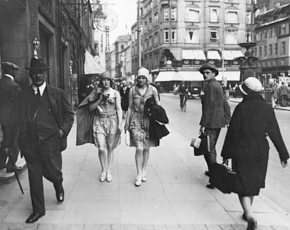 See the history of the pedestrian street described and illustrated in details. A wing of the pedestrian street on a hot summer day with lively activity in relaxed surroundings. 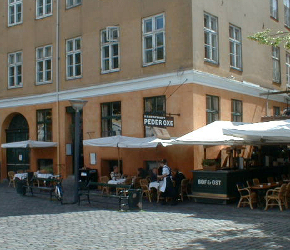 Many cozy sidewalk Cafés and restaurants are placed alongside the pedestrian street. From the other end of the Town Hall Square - east to west - the grand Vesterbrogade - stretches way down to the Zoo Garden at Valby - with hundreds of big and small shops in all categories - blended in as a perfect mixture that matches the vibrant city atmosphere. It will take more than a half day to walk up and down Vesterbrogade and the joined shopping streets to Valby - and back again to the Town Hall Square. This part of the city is called - Vesterbro - which is the genuine Downtown Area of Copenhagen. 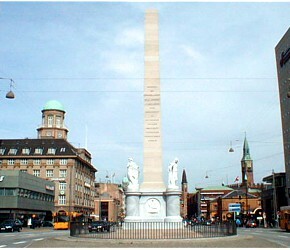 When entering Vesterbrogade one will pass Tivoli Gardens - (Hovebanegården) the Central Station - (Frihedsstøtten) Liberty Memorial Monument - (Københavns Museum) Copenhagen's Museum and much more. From Kongens Nytorv (The Kings square) - end of pedestrian street - and to the other end of Copenhagen - the Zoo Gardens - there is almost 5 km of shops - shops and shops. The route can start at Kongens Nytorv - then walk up through the Pedestrian Street - pass the Town Hall Square - (take a pause here and enjoy a red Danish hotdog) - then enter Vesterbrogade right to the Zoo Gardens. The walk tour will nearly take a half day each way. With a free city bike the trip will be reduced to half time. For shopaholics and bargain hunters - this is the ultimate shopping and workout tour as well as a great way to experience Copenhagen. Department stores and numerous speciality shops on the long pedestrian street offers the latest fashion trends and designer collections - plus a variety of restaurants on the shopping streets. The extensive Vesterbrogade has a special atmosphere and is the authentic Downtown Area of Copenhagen plus an oasis for shopaholics with the Liberty Memorial from 1799 as its landmark. Monday-Friday: 9.00/9.30/10.00 a.m. - to - 5.30/7.00 p.m.
Saturday: 9.00 a.m. - to - 4.00/5.00 p.m.
Monday-Friday: 9.00 a.m. - to - 9.00 p.m.
Saturday: 9.00 a.m. - to - 5.00 p.m.
Small supermarkets, kiosks, bakeries etc. Open: 10.00 a.m. - to - 4.00 p.m.
Bakeries open early every day. The first Sunday in every month – shops and malls are open from 9:00 to 17:00. The page and site is under revision!! !